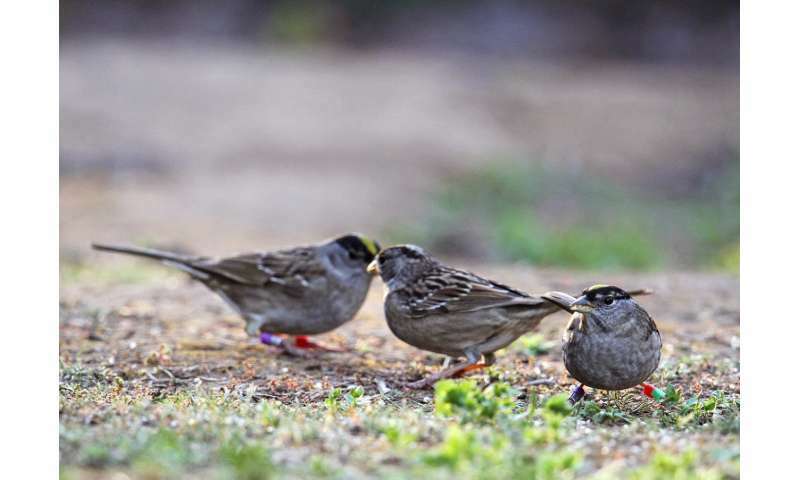 Scientists studying winter flocks of golden-crowned sparrows at the UC Santa Cruz Arboretum have discovered surprisingly complex social behavior in these small migratory birds. A new study reveals that the sparrows have different ways to assess dominance status depending on whether the interaction is with a familiar bird or a stranger. 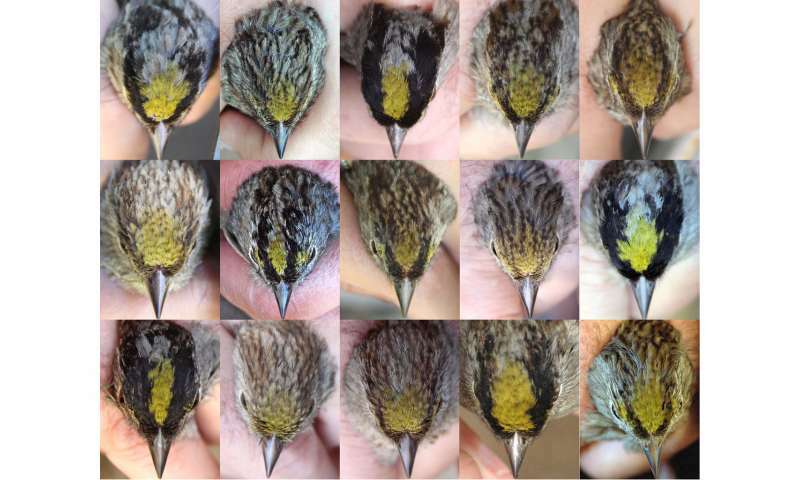 Previous studies by the UC Santa Cruz researchers showed that the patches of yellow and black plumage on the birds' heads serve as "badges of status," signals that correlate with fighting ability and allow birds to figure out who is dominant without having to fight. Birds with bold crown coloring are dominant over those with duller crown colors, regardless of whether the bold colors are natural or painted on by the researchers. Those were the findings of two studies published in 2011 and 2013, in which the researchers staged confrontations by placing two birds captured in different locations together in an aviary. "To show that birds are using badges of status, you have to pit birds against each other that have never met to make sure they do not have prior information about fighting ability," explained Bruce Lyon, professor of ecology and evolutionary biology at UC Santa Cruz. Lyon's lab has now been studying the Arboretum's golden-crowned sparrows for 15 years. The plumage studies have been led by Alexis Chaine, a former graduate student in the lab who is now at the National Center for Scientific Research (CNRS) station in Moulis, France. In their latest study, published July 25 in Ecology Letters, the researchers found that badges of status don't matter to golden-crowned sparrows that already know each other. The researchers can paint bold colors on the crown of a dull-colored sparrow and it will still be as subordinate to other birds in its flock as it was before the plumage makeover. "Plumage manipulations do not fool birds that know each other," Lyon said, noting that the researchers decided to return to the plumage manipulation studies after subsequent studies revealed close affiliations between birds in winter flocks. "The idea with badges of status is that they will be useful to animals that live in large or fluid social groups where they wouldn't be able to recognize and remember the fighting abilities of all the opponents they might encounter," he said. "We realized that the previous experiments we did with unfamiliar birds did not represent the social context in which these sparrows spend most of their time in winter." The new findings show that golden-crowned sparrows use crown plumage to resolve dominance status with strangers, while social recognition governs dominance relations with familiar birds. The researchers have found that all yearlings have dull crown colors, but the plumage changes and becomes fixed in a bird's second year. At that point, there is tremendous variation in the crown plumage of different birds, but an individual's coloring remains the same for the rest of its life. "Some of that is likely due to genetic variation, but it could also be affected by early experiences or developmental conditions. At this point, we just don't know," Lyon said. An understanding of the social networks of wintering golden-crowned sparrows emerged from work led by Daizaburo Shizuka, another former graduate student in Lyon's lab who is now at the University of Nebraska in Lincoln. A study published in 2014 showed that the same birds come together in the same locations year after year, forming short-term feeding flocks that are subsets of distinct social communities with well-defined home ranges. They do this after migrating thousands of miles from their summer breeding grounds in northern Canada and Alaska where, instead of forming flocks, they fiercely defended small individual territories around nesting sites. "The birds within each community return year after year to hang out with the same friends. It's not just that they overlap on the same turf. They appear to form very close lifelong winter relationships," Lyon said. "Normally, such close affiliations are driven by kinship, but our genetic study showed that kinship is not a factor in these communities. We suspect that these friendships are driven by the benefits of cooperation." By forming flocks with familiar birds, golden-crowned sparrows are able to spend less energy on aggressive interactions and more time feeding, improving their chances of surviving through the winter. In their experiments, the researchers found that sparrows showed less aggression and spent more time feeding when paired with a familiar flockmate than when paired with a stranger. Traditionally, researchers have looked for either badges of status or individual recognition as the mechanism for resolving dominance status in a given species, but not both. The system seen in golden-crowned sparrows, with context-dependent use of both mechanisms, may be more common than is currently recognized, Lyon said. The roles of badges of status and individual recognition in dominance behavior raise many questions that have led to long-running debates among evolutionary biologists, he said. A key question for badges of status has been, what keeps them honest? The whole system would break down if, in the case of golden-crowned sparrows, crown patches did not correlate with fighting ability, allowing a "cheater" with bold crown coloring but poor fighting ability to dominate the seed pile. In their new paper, however, the researchers suggest that the use of both badges of status and individual recognition in different contexts can diminish the value of a dishonest badge, because interactions within a social group no longer rely only on badges of status. "Badges of status might be used to settle dominance when a bird initially joins a group, but recognition subsequently modulates interactions," they wrote. In addition to Chaine, Lyon, and Shizuka, the coauthors of the new paper include Theadora Block and Lynn Zhang, both of whom worked on the study as UCSC undergraduates (Block is now a graduate student in Lyon's lab). 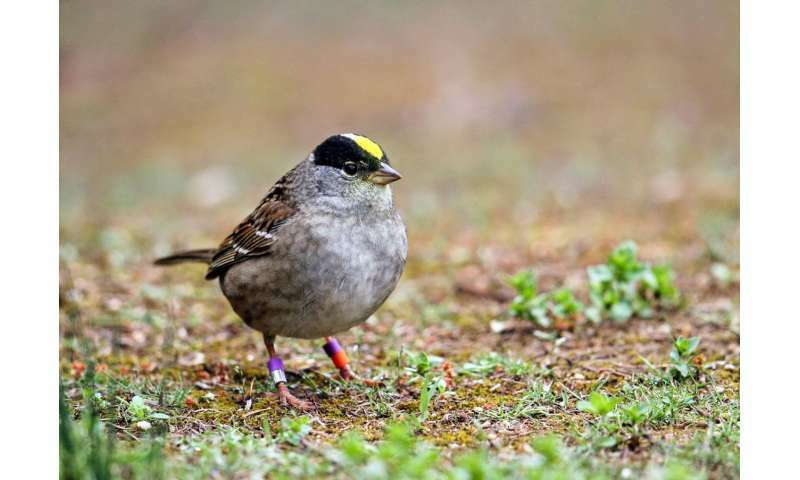 Lyon said dozens of undergraduates have been involved over the years in his lab's research on golden-crowned sparrows at the UC Santa Cruz Arboretum. In fact, the long-running research program began as a project for undergraduates in a class Lyon was teaching. "It started out as a side project in our lab, and now it may be one of the most complete studies that have been done of winter flocks of migratory birds," Lyon said. "We still have a lot of interesting questions to investigate."